I’m learning something about the coffee biz here. And it’s dark and disturbing. And it has to do with USAID, which the author blithely presents as a positive force and a friend of specialty coffee (a term I’ll ‘never’ like, but which the industry loves to death). If I said that I hope the author, Kenneth Davids, is ignorant about the American Empire’s use of democracy enhancement organizations like USAID to spread death and destruction around in vulnerable countries all over the world, Would that would be a kind thing to say? I don’t want to assume someone, who I don’t know, is stupid. In one sense, I hope he is ignorant because that would here make him innocent. In another sense, I hope he’s knowledgeable about what’s going on in the world, but that would make his statements about USAID scary. Then again, One can see and then turn away, if one so chooses. Many do. If Kenneth, who no doubt is a smart fellow – I always quip that folks should get degrees for knowing coffee the way people like Kenneth know coffee – knows about USAID but has been persuaded by it’s seeming friendliness toward social justice causes, then he’s making a mistake. USAID has a history of making the right sounding noises and then betraying those who trusted it. Check out “Counterinsurgency Down for the Count in Afghanistan….” by Ann Jones (on ZNet). “American development was supposed to have made it all so much better. But tales abound of small, successful projects in education or health care, funded by the U.S. Agency for International Development (USAID) and then dropped without a single visit from USAID monitors afraid to leave their Embassy fortress in Kabul. Regularly, USAID now hands over huge hunks of “aid” money to big, impossibly ambitious, quick-fix projects run by the usual no-bid Beltway Bandit contractors whose incompetence, wastefulness, unconscionable profits, and outright fraud should be a national scandal. USAID (United States Agency for International Development) is a nasty, nasty ‘democracy enhancement’ organization and a tool of the corporatocracy for safeguarding, entrenching and extending neoliberal capitalism and freedom and prosperity for a minority. There are a plethora of such democracy enhancement organizations designed by the corporatocracy to do one thing, as Chomsky explains in his breakdown of the whole project, namely ‘deter’ democracy. That is, Corporatists have no use for ‘common’ democracy. But they are perfectly fine with ‘elite’ democracy, which, in fact, is against common democracy. See Democracy Enhancement Part 1 & Democracy Enhancement Part 2. Both essays, found on the indespensable Third World Traveler Website, are by Noam Chomsky. I’m sure that sharing with folks in the coffee biz my lessons about the coffee industry’s attractiveness to the worst kind of people would be no easier than sharing them with folks in the general population. 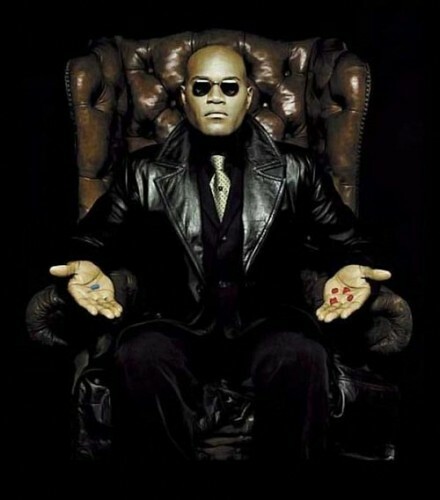 A lot of people prefer the ‘blue pill’, which is the pill offered to people plugged into the Matrix in the movie of the same name. They are offered a choice between a red pill that is the first step to getting unplugged and free and becoming a fighter against the Matrix and it’s anti-human operators, And a blue pill that leaves them plugged in and blissfully, almost fully, unaware of the reality of their enslavement. But alas, I am who I am. I didn’t start blogging just to turn tail and run when it becomes a real possibility that movers and shakers in the coffee biz, who I’m starting to meet, may read my blog and find it too disturbing. I hope that those in the biz who I give my contact info to and who find their way here are ‘not’ blue pill people. But some will be. Possibly all will be. That’s just been my experience. As for me, Can I not leave the politics out of the coffee? Well, Sure! If it’s not there. I am not trying to cut my own throat. Nor will I beat people over the head with my beliefs or my knowledge. Just don’t ask me to not see or know or care like so many others. To blue pill folks, It doesn’t matter what I say or do. I’m always too yappy! Well, Morpheus wasn’t telling anyone that they ‘had’ to take the red pill. Neither am I. “To qualify for membership in respectable society, one must appreciate a simple thesis: we are perfect. Therefore we need only ask what is the right course for a saintly power, how best we may proceed to “save people from others or from themselves” — not from us, surely. The tune is, in fact, a very familiar one, an interesting topic for some other time. “Like earlier angelic powers, we are able to recognize that there are some flaws and errors in the record. But the sophisticated understand that history can teach no lessons about our institutions and the ways they have functioned, surely nothing about what may lie ahead. Review of the historical record is nothing more than “sound-bites and invectives about Washington’s historically evil foreign policy,” Brown University professor Thomas Weiss writes with derision, hence “easy to ignore.” A perceptive comment, accurately discerning the most valued principles of the commissar culture. USAID, specifically, gets covered in part 2 of Chomsky’s two-part essay. This entry was posted in Coffee and tagged beans, Chomsky, Corporatocracy, darkness. Bookmark the permalink.